George Müller was a 19th-century Prussian-born evangelist, philanthropist, and a man of incredible prayer and faith. He established five orphanages in Bristol, England, which accommodated two thousand orphans – all built and supported entirely by prayer. In 1835, when God put it into George Müller's heart to build the first orphanage, he had only two shillings (50 cents) in his pocket. At the time of his death in 1898, Müller had received the equivalent of an incredible $180 million in today's currency through prayer and faith in God alone. 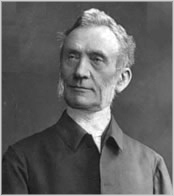 Müller's early life contrasted his later devotion to God. As a young man he was a thief, a liar and a gambler. Aged 20, he followed his father's wishes to train to become a clergyman in the Lutheran Church. It was while Müller was studying divinity at the University of Halle that a friend invited him to a Christian house meeting. The simple honest devotion to God that he encountered made a huge impression on George and it was a turning point in his life. Orphaned children, 19th Century. 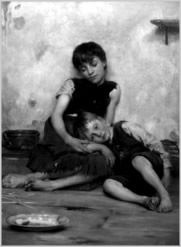 Müller encountered scores of homeless children like these living on Bristol's cruel streets. Years later, when living in Bristol with his wife Mary, George began his life's work with orphans in 1836 by taking twenty six young children into their rented home. Müller had been confronted by the hardship and poverty endured by the abandoned children of Bristol's city streets. Since the amendment of the Poor Law in 1834 their only recourse was the Workhouse (an institution made notorious by the writings of Charles Dickens – a contemporary of Müller's). Soon after, three other houses were rented and furnished, accommodating a total of 130 children. By 1845 Müller decided a separate building was necessary to house the children, and in 1849 the first orphanage at Ashley Down, Bristol, was opened. One morning the plates, cups and bowls on the table were empty. There was no food in the larder, and no money to buy food. The children were standing waiting for their morning meal, when Müller said, "Children, you know we must be in time for school." Lifting his hand he said, "Dear Father, we thank Thee for what Thou art going to give us to eat." There was a knock on the door. The baker stood there, and said, "Mr Müller, I couldn't sleep last night. Somehow I felt you didn't have bread for breakfast and the Lord wanted me to send you some. So I got up at 2 am and baked some fresh bread, and have brought it." Müller thanked the man. No sooner had this transpired when there was a second knock at the door. It was the milkman. He announced that his milk cart had broken down right in front of the orphanage, and he would like to give the children his cans of fresh milk so he could empty his wagon and repair it. Müller's five homes for orphans at Ashley Down, Bristol. Every morning after breakfast there was a time of Bible reading and prayer, and upon leaving the orphanage every child was given a Bible. The children were dressed well and educated – Müller even employed a school inspector to maintain high standards. No child left the home until employment had been found for them. Many were found jobs in domestic service, nursing, as trainee teachers or apprentices. His detractors accused Müller of educating orphans "above their station" and of robbing the factories, mines and mills of labour. Toward the latter part of his life Müller's most moving reunion with an orphan was in 1878 when a 71-year-old widow met him – she had been his first orphan, 57 years earlier. Since then over ten thousand orphans had followed her and over three thousand were won to Christ through Müller's ministry and by the Holy Spirit. He said he knew of some 50,000 specific answers to prayer. When he died, his funeral brought the city of Bristol to a stand-still as tens of thousands of people lined the streets and eight carriages joined the procession.